Increases strength, flexibility and heart health. Improves posture, prevents cartilage and joint breakdown, protects the spine, betters bone health, increases blood flow, boosts immunity, drops blood pressure, and leaves you feeling relaxed and at ease. 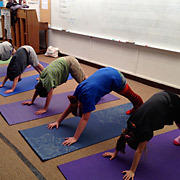 Develops flexibility, balance and coordination, builds awareness and concentration, increases confidence and positive self-image, nurtures creativity, reduces anxiety and stress, calms the mind, supports healthly sleep habits, boosts connection to self, others and nature. 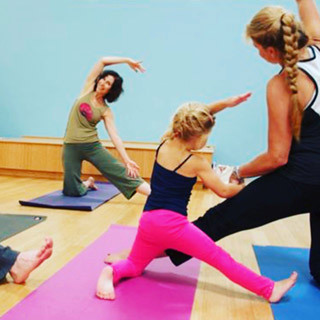 A small yoga class for all ages: a group of adults, or parents/care givers and children and/or teens, or a group of teens, or a group of children. Mindful and meditative practice that invites everyone to tune in, breathe and practice together. 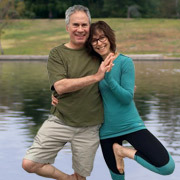 Participants decide if they want to practice individual poses only or combine it with partner and/or group poses. In addition to developing strength, flexibility, and balance, focusing the mind, and relaxing the body, participants in a small group class develop compassion and supportive friendships. Work together and support each-other as you breathe, balance, stretch, strengthen, focus and relax together in a variety of yoga poses. Strengthens body and relationships, enhances sense of balance (emotionally, energetically and physically) increases communication and trust, reduces anxiety and stress, creates fond shared moments and improves awareness and trust. Step by step, you are guided through a slow, peaceful, meditative experience with a specific purpose. Some guided meditations are aimed at simply quieting the mind and focusing on the breath, others are aimed at awakening and bringing a sense of balance to our chakras (energy centers), while others are aimed at releasing and reducing fear, anxiety and judgement. Additionally, many guided meditations use imagery to assist the meditator in the letting go of thoughts. Quiets the mind, relaxes the body, increases awareness, reduces stress, anxiety and depression, develops compassion and kindness, builds healthy sleep habits, and supports the immune system. Spiritually guided life force energy. Rei means Higher Power and Ki means life force energy. Reiki is a Japanese technique that utilizes spiritually guided life force energy to improve one’s health and quality of life. Increases our supply of life force energy, promotes healing, creates deep relaxation, reduces stress and tension, clears the mind, improves focus and inner calm. A Reiki treatment moves us toward our own individual physical, mental, emotional and spiritual balance so our body’s own healing mechanisms can function more effectively. Reiki is appropriate for all people (children through adults) and for our four legged friends as well. Customized individual or group sessions brought to your work space. Push the tables and chairs to the walls and presto…you have a practice room! Brighten and lighten up your (and your work mates) day with an early morning, lunch time, or late afternoon mindful movement and meditation. Great team building! Helps co-workers connect with eachother in a non-competitive environment. Creates calm, strengthens flexibility and balance, reduces stress, builds mental clarity, recharges the body and mind. 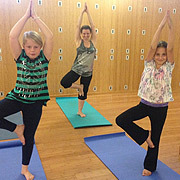 Mindfulness yoga offers children of all ages tools for developing inner resilience to help them navigate emotional, mental and physical stress as well as the overwhelmeing pressure to achieve. Great way to bond with friends while nurturing yourselves and each-other. Have fun, de-stress, chill-out, feel energized and refreshed. *We do not rent or sell your information to any third parties. I grew up in Los Angeles and began dancing and practicing yoga as a young girl. My passion for movement inspired me to study Dance and Child Development in college. I earned my BA degree in Child Development and Dance from California State University, Northridge. Upon graduating college, I created an enrichment program called: Kids in Motion, and set up classes in schools, temples, churches and health clubs throughout Los Angeles. During this time, I developed Kids in Motion into an interactive/participatory TV program and co-wrote, co-produced and performed in Kids in Motion: A Creative Movement and Music Program. The show aired on Nickelodeon for several years and was released as two video cassettes by CBS/Fox. I also wrote the Kids in Motion book and collaborated with the song-writers on the soundtrack album produced and distributed by Greg and Steve’s Youngheart Records. The Kids in Motion CD is still a top seller on Amazon today receiving 5 star reviews. Kids in Motion earned the Action for Children’s Television Award, Parent’s Choice Award, and the Good Housekeeping Award and was endorsed by the American Academy of Pediatrics. Additionally, Billboard Magazine nominated Kids in Motion as one of the best kid’s videos. I’m pleased to announce that because fans have posted videos from Kids in Motion on YouTube with millions of views and thousands of comments, I’m now in the process of creating New Kids in Motion as an OTT network. CLICK HERE to purchase Kids In Motion on Amazon.